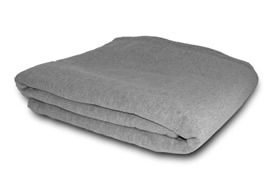 Regardless of the size, the words "sweatshirt throws", "sweatshirt blankets", "sweatshirt throw blankets" or "university blankets" are used interchangeably. Sweatshirt blankets come in different weights that are labeled in ounces or grams per linear yard. A heavier fleece weight will mean a thicker blanket. We ship blank, wholesale sweatshirt blankets nationwide from warehouses located throughout the country; whichever is closest to you. Style: SB3036...$240.00 (48 per case). Style: SB5060...$246.00 (24 per case). Style: SB5484...$324.00 (24 per case). Search engine results pages are full of companies that offer "Cheap Wholesale Sweatshirt Blankets", “Cheap Wholesale University Blankets”, or “Cheap Wholesale College Blankets.” If all you care about is price, contact them. 1. E-mail us the Wholesale Sweatshirt Blanket Order Form. 2. Note: You will need a PDF editor in order to fill out this order form, or a printer so that you can fill out the form and fax it to us. If you have trouble opening and saving the order form, please email us and we will email you an order form. Be sure to state in your email that you would like the "Wholesale Sweatshirt Blanket Order Form." 3. Once we receive your completed order form, we will reply to you with a quote. If you agree to the quote, call or email with credit card information. We will not proceed with your order until you approve by e-mail or fax.